Participating in the Lions Worldwide Week of Service (Protecting our Environment, 16-22 May 2015), the club hosted the park cleanup. 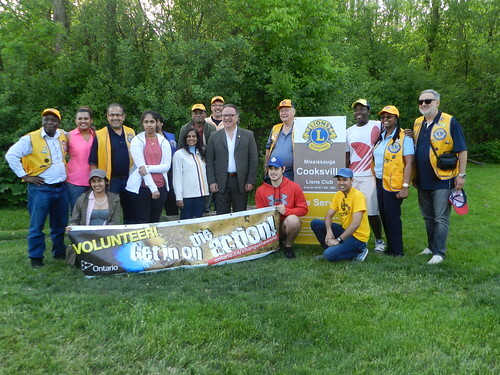 This event saw members of the Mississauga Cooksville Lions Club, our family members, youth volunteers and the community around the park coming together to show that we care about our environment. This project also included a donation drive on behalf of Our Place Peel, the only emergency youth shelter in the Region of Peel. Participants donated a box full of wish list items to the shelter. Mississauga Ward 7 City Councilor Nando Iannicca kicked off the event by sharing the importance of community service. To celebrate the birthday (13 January) of Lions Clubs International's founder, Melvin Jones, and to participate in the Lions Worldwide Week of Service (Fighting Hunger, 10 - 16 January 2016), the Mississauga Cooksville Lions Club organized a Food Donation Drive among family and friends and donated 500lbs of food to Seva Food Bank, Wolfedale Rd, Mississauga. The lions also spent 2 hours sorting, packing and shelving the many donations. 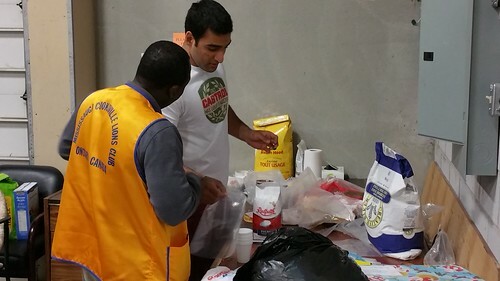 Marianthi Karras, the Volunteer and Staff Engagement Coordinator of Seva Food Bank, welcomed and oriented Lions to the food bank operations and shared about the food bank's effort to eliminate the stigmas and stereotyping of clients of a food bank. It was an eye opening and fulfilling experience.